This post is a bit late, but my whole evening got pushed back about an hour and a half because I went to the supermarket. This might not sound major, but getting out of the door with my son, as well as getting him in and out of the car, shopping trolley etc really eats up the minutes! So my son went to bed at 9 instead of 7:30, I ate at ten, then sat around for a bit, I'm really tired and unmotivated... Caleb woke up at 6:30 this morning, then I had my exercise class at half past 10... He didn't fancy having a nap until 3 in the afternoon, so it's just been one of those days! Anyway, I'm excited to be actually sat writing a post after editing the photos, it seems like ages since I've done this. My holiday threw me off because scheduling posts meant I was out of the routine of posting! I still can't find my camera, so these photos are taken with my iPad, I'm sorry about that. This is driving me NUTS because I swatched a couple of Models Own polishes last week so I know my camera is in the house somewhere waiting to be found! Tonight's post is a Barry M polish I bought the other day. It is from their Jewel Glitter range and it's called Gold Mine. I love this collection, but honestly, I think I have more chunky glitters than regular polishes, and glitter is all I'm buying, so I just picked one to buy. 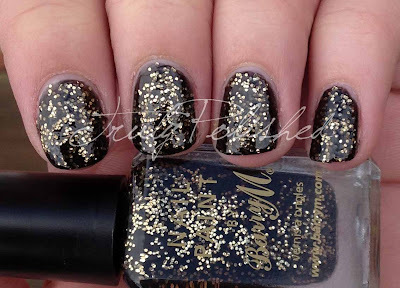 Gold mine contains gold hex glitter in a black base. I love how this looks, it has a lot of depth because of the slightly sheer base. Some of the glitter is partially covered by the black and some of it is at the top, it looks very unique. I've been wanting a glitter like this for the winter because I own nothing else like it. I think Gold Mine sums up the party season, and I'll definitely be wearing this over Christmas and New Year. This polish is available for £2.99 in all the usual outlets. I bought mine from Boots, but you can also find it at Superdrug. Boots have a buy one get one half price deal on at the moment, and Superdrug have a 3 for 2 deal, so you won't have to pay full price for this. You can also find this on a lot of online retailers, including the Barry M website! See you back here tomorrow (technically later on today but you know what I mean!) when I'll be introducing a new feature!